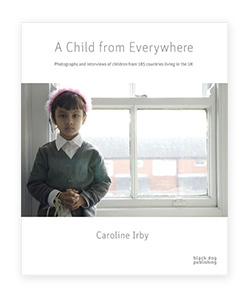 A Child from Everywhere is a collection of photographs and interviews from Caroline Irby of children who have migrated to the UK. Caroline set out to find one child from each of the 192 countries in the world now living in the UK; 185 children agreed to take part in the project. The photographs of the children, aged nought to sixteen years old, are accompanied by interviews in which the children are provided the opportunity to give their side of the story. Opening with an introduction from Aminatta Forna, A Child from Everywhere reveals the children’s expectations of the UK, feelings upon arrival, cultural differences, ideas on community and thoughts on the future, along with details on their everyday life. This mix of international children reflects the world’s wars, natural disasters, despotic regimes and economic migration, painting a vivid image of the world today. The result is an engaging portrayal that allows the children to speak for themselves, providing a unique insight into the effects of globalisation.